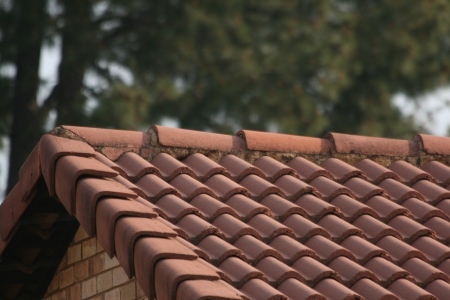 Coverland’s Dry Ridge System is an innovative alternative to mortar ridge and hip-line fixing. Not only does it allow for thermal expansion and contraction, but it also allows for optimum air circulation of the roof space. A person can produce an estimated three to four litres of water vapour a day using appliances such as dishwashers, tumble dryers or by cooking and showering. The vapour rises and condensation forms in the roof construction, affecting the indoor climate and the roof structure. However, if the roof is well ventilated, the air circulates from the eave via the underlay to the roof ridge, removing the moisture through the air flow. Coverland’s Dry Ridge System not only protects the roof construction from outside humidity, but also provides optimum natural ventilation from the eaves of the roof structure to the ridge to remove heat in the roof. Part of this system, the Compact Roll provides an innovative alternative to traditional mortar ridge and hip-line fixing methods, and allows for the thermal expansion and contraction of the roof structure. “While the initial setup costs of mortar application may be driving its popularity, it also has its flaws,” Willem Grové, marketing manager at Coverland, points out. “Hardened mortar does not expand and contract with varying weather conditions or daily temperatures, which can lead to cracks. Rain that penetrates the ridge and hip line through these cracks can damage the interior of the roof and eventually cause trusses to rot, posing a serious risk to the occupants. “In addition, ridge and hip lines that are fixed using the mortar method and then coated with a waterproofing coating or compound, look unsightly and cost extra to repair,” he states. Although more expensive than traditional mortar fixing, the Coverland Dry Ridge System is a long-term solution that is easy to install, aesthetically pleasing and maintenance-free. As per its name, the Compact Roll can be dry applied to ridges and hips. It can be stretched to fit any roof profile and its unique, integrated waterproofing and ventilation features, when combined with the Pliable Ridge Tree, provide optimum airflow and 100% leak-free performance, according to Grové. 1. Sustainable sealing (butyl-supported aluminium compound). 2. High tearing strength (highly resistant PET Polyisobutylene compound). 3. Maximum waterproofing properties, while allowing ventilation (ventilating holes are covered with a high-performance fleece). 4. Extreme adhesion, due to the highly effective CH-bond butyl glue. Coverland’s ridge and hip roofing solutions are produced and tested in Germany and locally, Compact Roll is certified by Agrément South Africa. Contact Coverland on info.sa@monier.com for more information with reference “W&R Dry Ridge”. • Cost savings on material and labour: Installed in one third of the time of traditional mortar ridge applications. • No cracking or leaking. Caption: A mortar ridge often looks unsightly and is costly to repair.